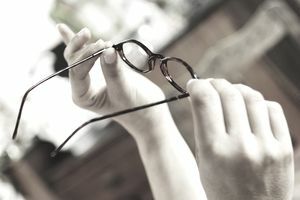 Looking for an inexpensive and effective way to clean your eyeglasses? Then, give dish soap a try. It works just as well as (if not better than) specialty lens cleaners and is even recommended by the American Optometric Association. Rinse your glasses under warm (not hot) water to remove any dirt or debris that might scratch the lenses. Then, rub a small drop of dish soap into each lens. Clean the frames too, if they need some attention. Then, rinse your glasses, wipe them dry with a soft, clean cloth, and voila—you'll have perfectly clean glasses in seconds. For the best results, stick to a basic, non-citrus dish soap. The acid in orange- or lemon-scented dish soap could harm the coating on your glasses. It's best to avoid moisturizing dish soaps, too. They could leave residue behind on your glasses, which will undo your cleaning efforts. Dish soap is designed to cut through food and grease, so it does a good job of dissolving the oils from your skin as well as any dirt that may have accumulated on your glasses. And since dish soap has been formulated to leave drinking glasses streak-free, it will leave your eyeglasses streak-free, too. Do you find yourself reaching for your shirttail whenever you notice a smudge on your glasses? If you're serious about keeping your glasses scratch-free, it's time to retire that habit. Just make your own on-the-go glasses cleaner by combining three parts rubbing alcohol and one part water in a spray bottle. You can even add a couple of drops of dish soap to get that oil-fighting power that you're used to. Then, label the bottle, and keep it in your purse or briefcase. Be sure to spray your lenses liberally when you clean them, so they don't get scratched. There's no need to rinse this solution off when you're done cleaning your glasses. Nose pads tend to yellow over time, and sometimes the nose pieces will even oxidize. If this happens, you can usually take your glasses back to where you bought them to ask for a free nose pad replacement. Many stores also offer free ultrasonic cleanings, which can help to remove any buildup that you're not able to remove from your glasses at home. Take advantage of these freebies, and you may be able to go longer between replacement pairs. Owning a Pet Is Expensive. Here's How to Save! Importing Prescription Drugs for Personal Use -- Is It Legal? What Are Compact Fluorescent Light Bulbs? How Much Can You Save By Switching to Solar Power?